If you have ever been in an auto accident (and we sincerely hope you have not! ), you will likely remember very little of what transpired immediately after the accident. This is normal; it is because of your body’s shock response. However, the minutes leading away from an auto accident are extremely important. All medical emergencies aside, what you say, what you do, what you notice around you, what is said to you, how many witnesses you speak to will all affect the trial. Because there will be a trial. If not a trial, there will be attorneys involved. How much information you can gather at the scene and time of the accident will likely prove to be pivotal. Therefore, as a practicing Injury attorney, I urge you to read this blog to understand what things you must do and in what order. 1. Stay Calm. Secure Everybody. The first thing is to stay calm, assess the situation, and secure everybody. Make sure that all those who were involved in the accident do not require immediate medical attention. Is anybody bleeding? Is anybody hurt? If there were children in the car, have they been thrown out of their seats? If there is somebody who require medical attention, call an ambulance first. Pictures of the scene of the accident after it happened always help your attorneys fight for you in court. Ideally, we want to see pictures of the scene of the accident right after it happened, before you move your vehicle. If is possible, and you are calm and able, taking photos either with your phone or your camera, or even having one of your passengers do it will help us place the vehicles in the roadway at the accident scene. However, under no condition must you linger in the roadway, placing yourself in further peril merely for a few pictures. If your vehicle is drivable, you have a responsibility to yourself, to your passengers and others to get that vehicle into a safe location. When you safely get off the road, try to take photographs of any skid marks on the road as a result of the accident. Other helpful pictures are those of the damage to the two vehicles, injuries and any other roadside structures. If both vehicles are drivable, you will likely never see the other person’s car again. So do try to take pictures while you are still at the scene of the accident. However, do not risk your safety or that of your family’s while you do this. If taking pictures will jeopardize somebody’s medical condition or safety, forget the pictures. Once you’ve done that also look and assess your position in the roadway. Are you in a safe location? Or is there traffic flying by you? Are you in the middle of the road? Are you close to any health hazards on the roadside? If it is safe to do so, maneuver your vehicle into a safe location until the police arrive. Be sure to look around you several times before you begin to move your car. You will likely be in shock, so err on the side of caution. Once you are there, do not waste any more time in calling the police. My advice to you is that you request a police report if there is damage in excess of $1,000 to either vehicle, or if somebody is injured, however minor it may be. The other issue that you should address with the emergency call is to let them know if people are in need of medical attention. Be sure to summon both police response as well as emergency medical personnel. If you are worried about insurance at this point, do not be. The insurance for the vehicle that you were in is going to cover any treatment including an ambulance ride and an ER visit. Because if you are injured, it is imperative that you seek medical attention. Please understand that you are not going to be stuck with a monumental ambulance bill because this particular type of accident is covered by no-fault insurance. 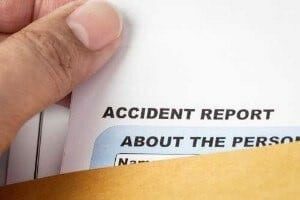 While you are waiting for the police, you can also get out any insurance information registration information as well as information from any of the drivers who are involved in the accident. Witness information is also critical to gather at this time. Oftentimes people will stop, ask if you are okay. Take this opportunity to ask if they saw what happened. Most of the time, people will gladly give you their name and phone number if you ever have to call them in the future to recount what they witnessed. This might be required if the person who caused the accident decides to change their story after they called their insurance company or their attorney or their parents, in the case of younger drivers. Any accounts you can gather and any witnesses whose phone numbers you can get will help protect yourself and your family. The next thing I recommend my clients do is to try to record what the other driver says to you. Oftentimes, they admit fault or apologize at the scene of the accident. If they say these types of things while others are around and witness it, then it is doubly helpful. Whenever the responsible party says things that are against their interest, it is called a party admission. These things are admissible in court; they are exception hearsay. This means that even though it might seem like a roadside conversation, it could make the difference in the case down the road when your attorneys are trying to address the issue of personal liability for fault. The final step is to acquire the police report and review it for errors and inaccuracies. If you spot any, bring it to the attention of the officer who was responding at the earliest. You may also provide witness information to that officer for verification. Sometimes, having an objective third-party corroborate your story can make all the difference in the world. Yup, you read that right. Companies. Make sure that you do not speak to either insurance company if they try to call you. Very often, you will receive a phone call from both companies. Even if they are your own carrier, the insurance regulations state they may not talk to you once you have retained counsel without your attorney’s permission. The question that insurance companies typically ask you are often to further their own interests and are not necessarily in your best interest. The only person you really can trust at this point to guide you and help you out of this mess is your attorney. If you have been a victim of a car accident, contact dedicated Car Accident Attorney Richard Nicotra in Buffalo NY to fight for you.